The Taipa Village is where the original community of the Taipa Island in Macau lies. The Village has then been one of Macau’s best attractions being one of the only two traditional villages left in Macau. The village is a small cluster of narrow streets, alleys and lanes, with old colonial houses lined up mostly on each side. The houses often adopt a yellow, blue and green shade of color, which produces a rather enjoyable appearance of the village all together. Walking along the pedestrian alleys, visitors will be able to peep into small traditional shops of the village that seem like they belong to a completely different era. Portuguese-styled offices, ancient temples and colonial villas blend in effortlessly with the old fashioned street lamps and hanging flower baskets of the village. Today, the village overlooks a long stretch of reclaimed land. Also within the village is the Taipa House Museum, which remains an excellent place for visitors to see the once living conditions of a typical Portuguese family during the 1900s. 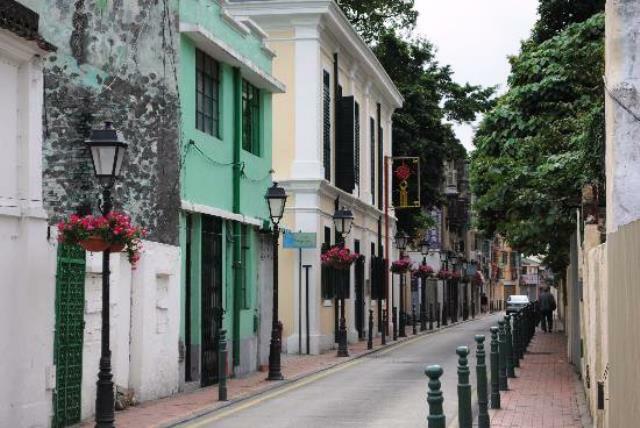 Along with visiting the Taipa Village, many tourists head straight to the nearby Rua de Cunha, which is more popularly known as the Foot Street. The entire strip and some off-road streets have plenty of small restaurants and eateries that serve homey Portuguese, Macanese and Italian food. Of course, Chinese food is also abundant in this area. Two of the most recommended eateries are the Restaurante Dumbo and Cozinha Pinochhio, which both serve gastronomic Macanese-Portuguese dishes in generous portions with relatively fair prices. Although both are famous among visitors, it doesn’t mean that they remain better than the others. Some opt for a more authentic and homey type of restaurant which can also serve equally sumptuous food such as O Santos, Galo, Dom Galo, Send Cheong, Serradura, Gelatina Mok Yi Kei, Antonio Restaurantes and Amagao. Despite feeling being transported into a whole new era, you’d have to remember that you are still in Macau after all. This means that when in Macau, there are always casinos everywhere and the Taipa Village is no exception. Several casinos including the Macau Jockey Club can be seen near the village where guests can watch races in comfortable air-conditioned places. These areas remain popular to the locals but tourists often visit such areas as well. Also located nearby are the Ruins of St. Paul and the tree-lined esplanade along the Avenida de Praia, which provides a colonial elegance to the area. Located on a hill east of the village is a neo-classical church named Our Lady of Carmel that was built in 1885. Winding paths that lead to church can be seen going through the Carmel Garden straight to the Avenda da Praia and finally the said Church. The Taipa Village remains popular with visitors wanting to catch a glimpse of the how the old Macau was. With a line of Chinese shop houses, Portuguese-style workplaces, small temples and a former firecracker factory, the narrow streets of this small, busy but colorful village come to life.